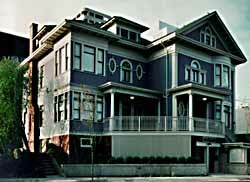 The Phillips House documents First Hill's transition from its late 19th-century role as an opulent neighborhood of wealthy citizens to its 20th-century status as a largely middle-class area of modest homes and apartments houses. In the 1880s, many affluent citizens moved out of Seattle's hectic downtown to build large, expensive residences in First Hill. By 1900 it was said that the residents constituted a "roll call of Seattle's financial muscle." The appeal of the area was clear: it offered an easy trip downtown and a picturesque view of the city, Puget Sound and the distant Olympic Mountain range. By the beginning of the 1900s, however, the streetcar line through First Hill attracted more middle-class citizens and transient workers. These new residents sent many of the city's wealthy residents towards more isolated neighborhoods like the Harvard-Belmont District. Accountant William Phillips's 1902 construction of a framed "double dwelling" house illustrates the shift of residents in First Hill. Phillips built a two-family home that boasted a half Classical Revival style/ half "Classic Box" design. Subsequent owners divided the Phillips House into apartments, and over the years the building deteriorated. City officials condemned the Phillips House in 1978, and it sat vacant throughout the 1980s. 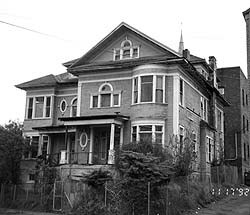 In 1992, Historic Seattle, the city's Preservation and Development Authority, purchased the property, and a Seattle architectural firm divided the Phillips House into 11 housing units for persons earning 30 to 50 percent of Seattle's median income. Today, the Phillips House represents the successful merger of historic preservation and affordable housing. The Phillips House is located 711 East Union St. It is not open to the public. The Phillips House after renovation. The Phillips House before renovation.